This picture says so much about me and about how I do things. It seems very staged. But it's not and that's why it's so funny to me. We had just finished the basement space and I had moved my crafting stuff into the room. At the same time, I was sewing curtains for the newly repainted kitchen. I pulled out the sewing machine, sat it on top of a vintage suitcase from my stash, and pulled up the nearest chair. A tiny chair built for a 3 year-old. But I only needed to sew little hems on a few pieces of small fabric. I would be done in just a few minutes. And then it hit me. This is how a crazy person sews. When I shared the pic on instagram, by sister commented that she wished she had a straight jacket emoji. Some things will never change for me. My crafting will always be impromptu. I still love sharing what I make and what I find but it is just not that easy to share from a blog. The instantaneous sharing from phone to picture to instagram is a perfect fit for me (at least for now). I'm a visual learner and obviously a visual sharer. I switched out the bright sunflower yellow for a pretty grey (dolphin fin) in the kitchen. Grey doesn't mean colorless. All shades of green are all mixed with pale yellow and gold. I still want to add simple curtain tops and art work. But I'll get there. Tudor houses don't have to be dark and serious and it's ok to paint the woodwork. I was taking these pictures yesterday while everyone else in the house kept putting stuff in my shots...flooring pieces, tools, lunch...pulling out the dishwasher because it stopped working. If life can be a metaphor, then the year my sisters and I have been through is like a hurricane; a hurricane with only the smallest of calm. We all helped our mom move from her home and into the cutest house ever. It was perfect and cheerful in every way. But it was so, so very brief. The details are too sad and too hard to share but, within a few weeks, our mom could no longer walk...no longer stay in her new home. I am pretty sure that I will always be shaking my head about how quickly everything happened. We were so quickly back with the same Sisters and nurses that had cared for my dad. So happy and so sad to see them all again. So quickly back to group texts with my sisters trying to figure everything out. I spent a lot of time in the evenings just sitting with my mom in her room and her small tv was always on Turner Classic Movies. The movies were slow and quiet...with no commercials. So I would leave the tv on and quiety watch. I watched "I Walked with a Zombie" on Halloween with my mom. I watched many more as my mom slipped farther away and was not really talking. One night, I was drawn into a movie. I couldn't hear what was going on but I didn't need to. When my sister came into the room, I told her how this guy and this girl seemed to agree to meet but the girl never made it. "It's "An Affair to Remember"... that's Cary Grant", she told me. And we watched it. And when my mom's nurse Tanesha came in at the very end of the movie, we told her wait, wait, wait. And we all sat down together. Tanesha on the end of my mom's bed, Jennifer in my mom's wheelchair, and me. My sisters and I were together when we said goodbye to our mom. Crying, laughing, praying...and so quickly planning another funeraI just a few days before Christmas. I guess we take away lots of things from our experiences. For me, I find myself watching TCM. Taking comfort in the slowness and the quiet. Still laughing with my sisters. Still sending group texts. Remembering my mom and dad. I printed a picture. Like on paper. At a place that magically does that. Walgreens even has an app that lets you select photos directly from your instagram account to be printed. I know this because I had to make something (just a little something) for my teacher friends. 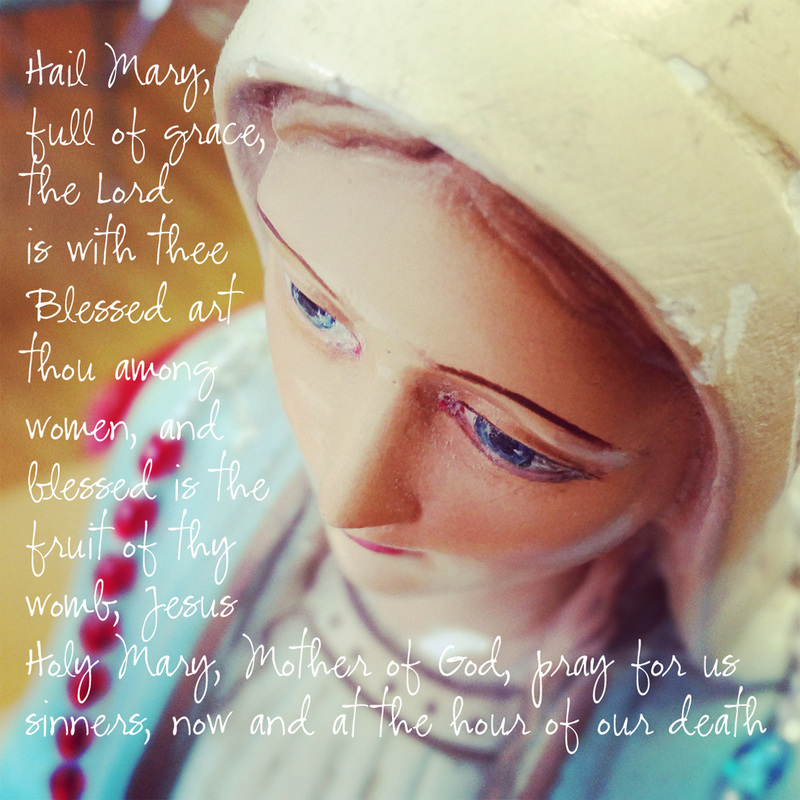 I had an instagram of the old-school Mary in my classroom. I added a Hail Mary. She's pretty and simple and she makes me calm; hoping she does the same for everyone that got one in their Advent package today. I am happy to share it. Download it, print it, and share it too. The house-changing frenzy that I was feeling this summer has slowed to a crawl. A super slow mo crawl. To refresh, we had all of our floors refinished this summer. Which made it easy to re-think my spaces and to look critically on what I wanted to keep...as in no mercy. I've been turning by eyes toward the "young tudor" look that is popping up everywhere. I've changed our computer room with pretty gray walls, artwork I love, and a thrifted bulletin board redo (and, even better, I got the ugly computer monitor moved out of that room so it really needs a new name). I painted every inch of my back hallway a pretty and fresh white (dark tudor woodwork is now singing a happy tune) and a gallery space for artwork is on my next-up list. I also looked critically at my living room and removed (almost) everything that was granny chic. The empty china cabinet was patiently waiting for a change. Paint? Wallpaper? Wallpaper! Me, the girl that put the idea of wallpaper into the "never again" pile. I found this paper at Lowe's. It is kind of textured and thick and I almost didn't buy it. But I reminded myself that I had nothing to lose but $30 on a roll of paper I might hate. I'm good at measuring, cutting, and matching paper and the back of the china cabinet was very forgiving because I could tuck extra paper in the space between the cabinet and the back panel. Start-to-finish was less than an hour and I don't think I cussed even once. And it's pretty. And young. We didn't mindfully move to an integrated neighborhood. We just moved to St. Louis (back home for me) from Detroit and wanted to live in neighborhood like Royal Oak. But now, 23 years, 2 houses only miles apart, and 3 kids later, I wouldn't live anywhere else. We live in one of the many tiny towns that make up North St. Louis County and live less than a mile from Ferguson Missouri. We eat, shop, and gather there. Our kids played in leagues there...too many games to count. We ride our bikes from our house to get ice cream there. Every Sunday morning, one of my boys drives his grandma to church there. My Mom lives there. Why? We all know each other and care about each other. My kids have grown up in a real place; sheltered in some ways (what are granite counter tops?) and exposed to some harsh realities at the same time. They've never lived anywhere else and they are not really all that aware of race. Just like the kids in my class when we study the Civil Rights Movement, they are like "Really? That happened? Schools were segregated? That is sooo weird". So my point? Ferguson is an integrated city; probably one of the most integrated in the country. We live here. We love it. We can't be routinely ignored by the rest of St. Louis. We can't let our schools fail one- by-one and be ignored by our state. We know how to help each other but we could use some support...that whole "it takes a village" thing. Ross and I walked to the NAACP gathering at a church by our house. He recorded snap chats (or whatever kids are doing these days) and loved giving directions to people that were lost. I went to my Aldi and Target only to discover that is was the command center for all the press and police activity. Nobody stopped me so I went to both stores. They guy ahead of me in line paid part of the bill for the family in front of him that was a little short on cash. I didn't watch any of our local news reports because I knew it would infuriate me; now I'm a fan of Chris Hayes because that guy landed in the middle of Ferguson, asked all the right questions, and got to the heart of the issue. My mom loves Ferguson and her neighbors but is (reluctantly) moving closer to us. In what could be perceived as bad timing, she listed her house for sale on the day that looting took place about a mile from her house. She had two excellent offers on the house and accepted one last week. We live here. And we love it. Whenever I'm away from my house for a while, I always think of things I want to change/fix/buy when I get back home. Combine those thoughts with reading "The Nesting Place" in the car and refinishing all of the floors in my house and I have the perfect storm of change. We've moved everything from neary every room and piled it into three rooms. It's like hoarders but more stressful; I have to climb and walk on furniture to get into bed. But the open space lets me see things with new eyes and the time crunch inspired me to paint the study and the back hallway. See all that pretty light in the back hallway? It was all dark wood trim and too-shiny orange walls yesterday morning. Now I'm thinking it will be a gallery space; a place for artwork and other pretty things. That midsummer panic hit me this week. It's predictable at this point and something I'm sure every teacher experiences. Yes, I still have a lot on my summer todo list but, when I really think about it, the little stuff sometimes adds up. For one, I added hooks to the vintage sign on our back porch (the vintage hooks from my mother-in-law's house that I soaked in paint thinner then neglectedly let get really rusty; nothing a little clear sealer couldn't fix). No one has poked their eye out (an irrational fear that my husband has about anything hanging at eye-level) and, even better, there's not as much junk on the kitchen floor. I've also done some random acts of painting (vingage stool, wooden accent table, front hallway and ceiling) and some sporadic crafting (including my own sewing "kits" so I'm ready to go when I have time). I also want to get all of the cool artwork that my kids have made out of the drawers and into our living space. But I've got the rest of the summer for that, right? Pinterest. It's a love/hate thing. I have used Pinterest for reference (mostly for recipes) but the bulk of my activity is pinning stuff I forget 30 seconds later; never to be seen again. For some reason (my love of letters/graphics?) I remembered the idea about spray painting plastic letters because when these letters arrived at school in a box of hand-me-downs, I grabbed them. And when I was spray painting a vintage stool and had some paint left, I painted the letters. This was not as easy as it seemed but it turns out that the letters are pretty cute with their cohesive "seaside" color scheme. But our refrigerator is not magnetic, So why? Why did I do this? I'm not sure but know I will eventually find a use for them (as long as I don't need more than two Es). So ballpark it. What percentage or fraction of Pinterest ideas do you put into play? I'm going with an optimistic 10%. Love. Hate.